A massive rain storm in southeastern Minnesota this week turned creeks and rivers into weapons sweeping away vehicles and homes, isolating cities and shredding the region’s highway system. The storm hit just before midnight on Aug. 18. Driven by rainfalls of a foot or more, the roiling flash floods knocked out bridges, undercut highways and clogged roads with mudslides and debris. Many roads that are still open have no shoulders remaining. Others highways were crimped by mudslides and made slippery by the mud. In addition, many highway sections no longer have guard rails. Staff from Rochester/District 6 responded within hours, closing roads, setting up detours and assessing damage to the region’s roads and bridges. Falkum witnessed the last remaining pier of the Hwy 76 bridge fall into the torrent that had been the usually placid Money Creek south of Interstate 90 in Houston County. Two of the steel bridge’s piers and most of its deck had already fallen when Falkum reached the site Aug. 19. “The whole bridge was totally swept away—the span, the piers, even the abutments,” he said. Two days later, Falkum said the creek was still raging, causing cave-ins and other damage in its path. In addition to disrupting highway traffic, Falkum noted several railroad bridges were damaged or destroyed. Near Minnesota City, he said, the rails that carry Amtrak and other trains dangled eerily in the air over their washed out roadbed. When the storm broke, Falkum said, the district activated its plan to check bridges most prone to scour, i.e., the washing away of bridge piers by moving water. Initial reports show little damage on known scour-critical bridges, he said, but noted severe scour led to the failure of the Hwy 76 bridge. That bridge was not rated as scour-critical. After the damage assessment, the bridge crews began helping maintenance forces with the laborious task of mud and debris removal and to make the region’s roads passable again. Dave Redig, district maintenance superintendent, said recovery from the flood will require a massive effort. He said, for example, about 1,500 feet of Hwy 74 in Whitewater State Park were destroyed by the Whitewater River. “They’re now just big holes in the ground,” he said. 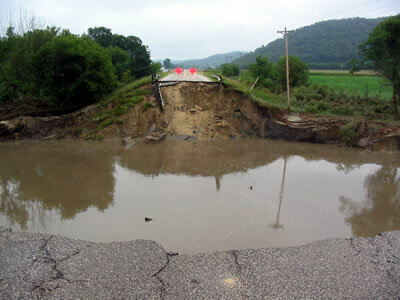 Hwy 16 between Houston and Hokah suffered washed out shoulders and other damage from the flood-prone Root River. “We have a lot of orange cones out there; we have lot of holes in the road,” he said. Before any reconstruction work can begin, however, crews will have to remove 100,000 cubic yards of mud and other debris. Redig said crews are working cutting trees blocking ditches into small pieces to ease their removal. When the floods first hit, maintenance crews worked around the clock, but Redig said work is now restricted to daylight hours. The restriction is needed because of the potential danger from unstable soils. “We don’t want anybody down there below the soil level where they could get hurt,” he said. National Guard troops and sheriffs’ deputies are managing traffic control, Redig said, allowing his crews to focus on recovery work. 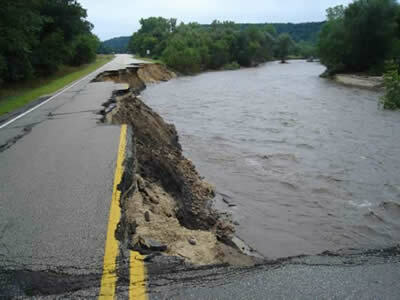 Other Mn/DOT districts have offered staff and equipment to support the recovery effort. Minnesota has been awarded an Urban Partnership Agreement grant for its proposal to improve traffic congestion on the Interstate 35W corridor. The $133 million grant will help improve traffic flow between downtown Minneapolis and the southern suburbs. It is intended to promote strategies to reduce traffic congestion in the nation's urban areas. Mn/DOT and the Metropolitan Council submitted the grant proposal to the U.S. Department of Transportation last spring. It includes bus rapid transit capabilities between downtown Minneapolis and the southern suburbs, conversion of high-occupancy and construction of additional park-and-ride lots along the I-35W corridor north and south of Minneapolis . Other UPA recipients include Miami, $62.9 million; New York City, $354.5 million; San Francisco, $158.7 million; and the Seattle area (King County), $138.7 million. For more information on the UPA grant visit the Web site at http://www.dot.state.mn.us/funding/upa/. The Robbin bridge on Hwy 11 in Kittson County in northwestern Minnesota was closed Aug. 21 after a crack was discovered in a girder support bracket during an inspection yesterday. This inspection was conducted under the directive issued by Gov. Tim Pawlenty to inspect state bridges after the collapse of the Interstate 35W bridge on Aug. 1. The Robbin Bridge, which crosses over the Red River of the North into North Dakota, will be closed for several days while Mn/DOT and NDDOT inspectors continue with further inspection to determine what repairs may be needed. The Robbin Bridge is also known as the Drayton Bridge on the North Dakota side of the Red River. The last routine inspection on this bridge in May did not show any deficiencies. The bridge is scheduled for replacement in 2009. Pat Harvell, Bridge Office, is suffering from a severe heart condition and is eligible to receive donated vacation hours from state employees. 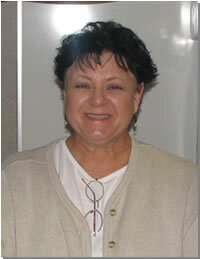 Pat Harvell has been a state employee for more than 34 years and currently works as an office and administrative specialist in the Bridge Office in Oakdale. Duke “Danny” Duquette, a transportation generalist at the Crookston truck station, has worked for Mn/DOT since 1981. Although geographically at opposite ends of the state and in vastly different jobs, the two share a common link: both are recipients under the state’s vacation donation program. The program is for employees who have used all of their vacation and sick leave because of their own illness or because they are caring for a family member who is ill. Donated hours allow eligible employees in the program to continue receiving a paycheck and benefits while they are away from work. In Harvell’s case, she is suffering from a severe heart condition and has had numerous surgeries, requiring a lengthy recovery time. Duquette is caring for his wife, Josita, who has been battling ovarian cancer for more than a year. She’s currently hospitalized and recovering from a recent surgery and will need Duquette’s assistance when she is released from the hospital. State employees may donate a total of 12 hours of vacation per fiscal year to the program to benefit one or more people. A summary of state laws enacted in 2007 that may affect Mn/DOT is now on the Office of Government Affairs internal Web site, reports Betsy Parker, Government Affairs director. Some of these new laws require specific action on the part of Mn/DOT, while others are simply informational items, Parker said. Contact Erik Rudeen, Government Affairs, at 651/366-4823 to obtain a copy of the actual law or get further background information. An event as traumatic as the Interstate 35W bridge collapse created shock waves throughout the department. Within a few moments, Mn/DOT’s priorities shifted. Business-as-usual was no more. Roles, responsibilities and duties changed markedly for many employees. From every quarter, employees contributed to the department’s response to the tragedy. In this issue of Newsline, we will tell some of their stories. We will tell more of those stories in future editions. On the night of Aug.1, 2007, student worker Garrett Schreiner just finished his shift at the Regional Transportation Management Center in Roseville. Typically, the RTMC staffs five people during peak periods, including a traffic broadcaster for KBEM radio, two dispatchers who monitor Twin Cities area traffic and two operators who monitor ramp metering and incidents. 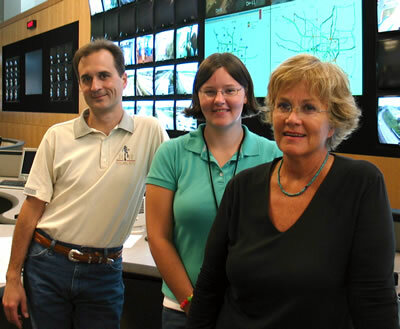 That night, Todd Fairbanks was keeping an eye on traffic on the east side of the Twin Cities metro area; Amber Tracy was working the west side monitors, and Mary Meinert was monitoring the ramp metering, detection and signage systems. There was an incident on Interstate 394 involving a stalled bus. A trooper asked for a FIRST driver’s assistance in the area. Just a normal, quiet night. Shortly after 6 p.m., everything changed. Fairbanks heard a State Patrol dispatcher suddenly say something about a collapse. He tried to operate camera 629, then camera 630 (located just north of the 35W Bridge) but the screens were blank. Meinert then turned camera 628, located just south of the bridge, so it faced north toward the bridge. For a moment, there was an eerie quiet in the control room. Then, a State Patrol dispatcher started fire and ambulance crews, while the RTMC staff started shutting down roadways. “A trooper called FIRST driver Julie Todora on the radio, and suddenly, the Nextel radios went crazy. FIRST drivers started calling in and asking where they were needed,” he said. Fairbanks’ mission was to get FIRST drivers located on the east side of the Twin Cities to cut off traffic headed southbound on I-35W. RTMC staff wanted to keep drivers away from first responders and also away from the scene. Fairbanks feels overwhelming sadness about that night, which seems like a blur. What stands out in his memory is how quickly the State Patrol, the Minneapolis Police and FIRST drivers went from “routine to rescue” mode in a split second. He was also impressed with how fast the Emergency Operations Center got up and running. “They were mobilized and working within an hour of the bridge collapse,” he said. Fairbanks ended up staying in the control room until 10 p.m. that night—three hours past the end of his shift. He said the feeling afterward was not unlike his reaction to the events of 9/11—sheer horror that such a massive structure could come tumbling down. When Amber Tracy first saw camera 628 turn toward the collapsed bridge, her reaction was complete shock. She’d driven that route every day from Eden Prairie for the last couple of years. Tracy remembers thinking, “This is going to be huge news.” She also quickly realized that she was one of the first to see the aftermath of the collapse. Immediately, she alerted the news media on the radio channel. The FIRST unit drivers, who monitor the State Patrol radio frequency, worked quickly with the State Patrol to shut down northbound I-35W at the I-94 commons, just south of downtown Minneapolis , as well as shutting down northbound Hiawatha, which leads into northbound 35W. Shortly after the incident, people started coming into the control room—from RTMC supervisors and Incident Command staff to extra State Patrol dispatchers. Once the FIRST units were situated roads closed and signs up, Tracy stayed until about 8:45 p.m. Maintenance crews came on scene and relieved the FIRST drivers, normal protocol in emergency situations. The day after the tragedy, Tracy went to Chicago on a previously-planned visit, and that helped clear her head. Since returning to work, everything has been fine in the control room. She notes the improved traffic flow patterns since the work was done on I-94 this past weekend. Mary Meinert heard the State Patrol dispatcher yell across the room, “35W Bridge down.” Moving camera 628 so it faced north, she saw white concrete smoke rising above where the span had just been. Meinert started putting up electronic message signs, 20 in all, and put “road closed” in the CARS system. Within 30-35 minutes, there was an energetic buzz in the room while the three co-workers got everything in place as well as fed traffic updates to Don Zenanko, who was providing continuous coverage on KBEM. During a crisis like that, your brain is going a million miles an hour, and it's hard to wrap your brain around the tragedy. Meanwhile, they also had to stay on top of all the other incidents that were taking place around the system that night. Meinert remembers the noise and energy levels rising in the room, as the radio went crazy. Following the end of her shift, she went upstairs to her office to cancel RTMC facility tours for the next day. According to Meinert, there’s a real sense of teamwork and ownership among the RTMC staff. Mn/DOT’s Freeway Incident Response Safety Team helps highway motorists with changing tires, providing gasoline for vehicles, assisting the State Patrol by removing debris, and providing traffic control and scene security at crashes. 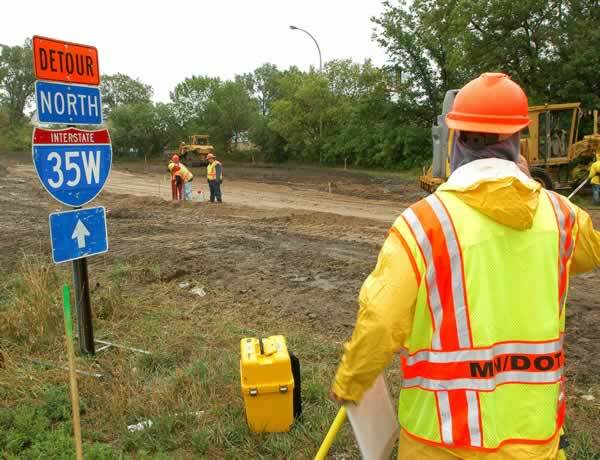 When the I-35W Mississippi River Bridge collapsed, FIRST units on duty responded by providing initial traffic control on northbound and southbound I-35W, along with the State Patrol and local law enforcement immediately after the collapse. Julia Todora was on duty and was one of the first FIRST units to respond. They began closing northbound and southbound lanes going towards the bridge and sent traffic to east I-94 to make sure that emergency staff could get through to the site. FIRST was relieved of traffic control duty by Mn/DOT Maintenance at approximately 7:15 p.m. , per their normal operating procedures, according to Todd Kramascz, operations supervisor at the Regional Traffic Management Center. Less than hour after the I-35W bridge fell, district officials established a safety command post a few blocks from the site. Doug Thies, Metro District, was the first safety administrator to arrive at the collapse site. Thies heard a radio report about the collapse, checked with Metro Dispatch and then headed for the bridge. He ordered all the Mn/DOT employees off the bridge and established a safety command post with the Minneapolis Fire Department and other agencies. District 7’s Dale Plemmons later joined him. They worked via e-mail and phone with Julie Bottolfson, Metro’s safety services supervisor, who was then in Ohio. They quickly put stringent standards in effect to ensure the safety of rescue workers, Mn/DOT staff, public officials and others who required site access. Mn/DOT safety officials also mapped the site for potential hazards to emergency responders and others working on the collapsed bridge, Bottolfson said. They have provided mandatory training, briefings and safety gear to anyone who is granted site access around the clock since the Aug. 1 bridge collapse. Bottolfson said that Mn/DOT safety officials are working with the federal and state Offices of Safety and Health Administration, the National Transportation Safety Board, the FBI and local authorities to ensure safety measures are followed during the recovery operation. Safety staff conduct two daily briefings on site conditions. They also require that all work crews complete a daily safety plan. The Metro District representative on the Incident Command staff provides overall direction for the safety staff. While envisioned for use in natural disasters or a terrorist attack, the state’s digital radio system that links emergency response agencies proved its mettle following the I-35W bridge collapse. “The system worked as planned; it did what it’s supposed to do,” said Tim Lee, who was acting Electronics Communications director at the time of the incident. Mn/DOT operates the system’s radio framework. Known as ARMER/911, the 800 MHz system is fully operational in Anoka , Carver and Hennepin counties. Its key feature is interoperability which allows responders to talk with each other and with others in pre-selected talk groups. The system provides state, county, city, fire, police and other agencies with a set of digitally linked radio channels they can share during crisis situations. Extensive training in the system’s use by agency staff in the Twin Cities metro area was a key factor in its success, he said. The system’s back-up capability also played a role. Lee said, ironically, that when a fiber-optic cable carried on the I-35W bridge was lost due to the collapse, the system immediately switched to another cable connection. That connection links the Regional Transportation Management Center in Roseville with the Hennepin County Sheriff’s Office in Golden Valley. Ramsey and Dakota counties will have the system working by the end of this year, Lee said. Scott and Washington counties will start using the system in 2008. There were a few minor problems, Lee said, but the system’s ability to allow scores of agencies communicate effectively with and among each other functioned well as it has during major snowstorms and other previous events. 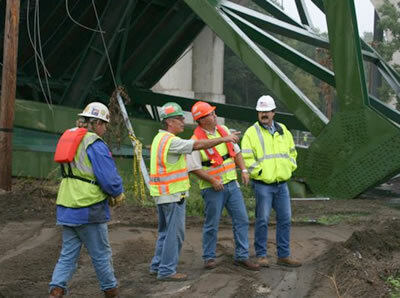 The collapse of the I-35W bridge put Minnesota ’s emergency preparedness procedures to the test, particularly in redirecting traffic when a route becomes blocked. “Mn/DOT has been working with other state and local agencies to coordinate individual plans, to know who’s responsible for different areas of the system,” said Cathy Clark, Homeland Security and Emergency Management planner. Clark was part of the group that developed a 2005 traffic management plan for five high-risk areas in the Twin Cities area that provides guidance for the quick evacuation of citizens and access of emergency response staff into a disaster site. The response plan worked well. According to Sonia Morphew Pitt, Mn/DOT’s Homeland Security and Emergency Management director, this plan involves more emergency management than planning. Morphew Pitt said that the I-35W bridge collapse was the first event of this magnitude in the Twin Cities metro area. “We’ve done exercises, responded to flooding and tornadoes, but this is our first major event. The response plan worked well. We deferred to a command structure and everyone knew their assignment and how to respond,” she said. Federal Emergency Management Agency training that Mn/DOT employees took contributed to the coordinated response to the disaster. Communications was also an important part of the Twin Cities metro area evacuation plan. “What the Metro evacuation traffic management plan does is help educate the public before emergencies happen about where they should go to get evacuation or detour routes,” said Morphew Pitt. A bridge collapsed! Which bridge collapsed? The one on Interstate 35W over the Mississippi. So began what has been one of the most stressful periods of time for Mn/DOT, especially for the Bridge Office and the Metro District. In the Bridge Office, there were requests for information from the news media, governor’s office and various Mn/DOT offices. All of the bridges in the state will have to be inspected. Plans, reports and records were reviewed and consolidated; engineers were placed on the wreck site; interviews with the press given; emergency contracts written; retirees were brought back, and district staff were transferred in. For many people in the office, work days lasted 16 to 20 hours and the work week never ended. The work load was not only heavy on those directly involved. Work duties of those responding to the emergency were reassigned to others so that the normal work of the office could continue. In the Metro District, maintenance crews were out on weekends and evenings placing cones, closing crossings and widening approach and exit ramps. All of these actions were the visible results of multiple hours of the district’s emergency traffic planning and engineering efforts. In the middle of these activities, an invitation appeared in our e-mail offering “I-35W incident debriefing meetings.” I attended one, not knowing exactly what I was going to experience. Mn/DOT’s Critical Incident Stress Management team was there. In three rounds of questions and answers, we shared about what we were doing when we first heard about the I-35W bridge collapse and how it initially impacted us personally; we shared about how it had affected us at work, and we shared about how we were dealing with the stress and emotions. One hour of time out of our still-busy schedules. What was accomplished? First, we learned that we were not alone with our thoughts. We learned that some people were more emotionally affected than others. I personally learned that I was more deeply affected by everything than I had realized. I learned that Mn/DOT recognizes that we are individuals who need support and that the agency is here to provide that. When you are so focused on helping others or dealing with an emergency, it is easy to lose sight of what is happening to you. On an airplane we are always told, “In case of a loss of cabin pressure, first place the oxygen mask over you own nose and mouth, then help those around you.” The Critical Incident Stress Management team makes sure that responders to crises are prepared to continue to serve, that they have their own “oxygen masks” on while they are dealing with the emergency. Jim Lilly, Bridge Standards, Research and Information manager, is a 19-year Mn/DOT employee currently working in the Bridge Office in Oakdale. He has had various assignments in the department, including seven years working in the Materials Lab in Maplewood and five years in the Maintenance Office in St. Paul.